Above: IPL treatment is one of many treatments available. Restore your skin for a glowing and youthful look with our variety of treatments! At Clear Sky Medical we work to make you feel better on the inside and the outside. As we age our skin texture and color changes, luckily there are many treatments available. In addition to our non-toxic skin rejuvenation treatments we also look at the source of skin problems that can stem from nutrition or hormonal imbalances. There are many things you may have questions about, so we offer a special free consultation with Dr. Meier, call us and mention the free consultation. Ultherapy – Tighten and lift: nonsurgical and without downtime. Dermapen – Needling for collagen induction, helps fine lines, pore sizes, scars and spots, rejuvenates skin over time with minimal downtime. 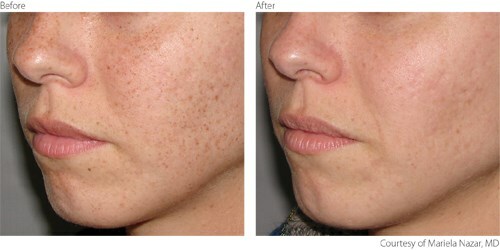 IPL and Photorejuvenation – Spot remover. Takes care of dark or red spots or redness on face, treats facial veins or superficial leg veins. Juvashape – Body contouring and minimal downtime skin resurfacing. Medical Microdermabrasion – Polish and smooth your skin instantly. CO2 Fractionated Skin Resurfacing – Gold standard in skin resurfacing. Remarkable for collagen induction, improvements in texture and complexion. Peels – Set the refresh button and let a new glow shine on your skin. From mild to medium depth, we have all the peels you need. PRP – Platelet Rich Plasma Send stem cells to heal and rejuvenate your skin or joints by harvesting the power of your own body. Vital Therapy – Toxin free skin care that rests your skin to a more natural beauty. Jan Marini – Your perfect skin care routine for more result oriented or problem skin. Award winning for best results in skin care! Juvederm and Restylane – Smooth and plump fine lines and wrinkles and lift cheek contours. Radiesse for men and women – Long lasting collagen induction and instant lift and structure for cheeks, chin or folds. Sculptra – Restoring collagen and structure for a natural rejuvenated appearance. V lase – intimate Rejuvenation, helps with stress incontinence and vaginal laxity and dryness, improves sexual gratification. Leg vein treatment with Sclerotherapy – Show off your legs! Treat spider and small varicose veins. Botox, Xeomin, Dysport – Wrinkle relaxers.